Wooden Monasteries of Konbaung Period : Ohn Don, Sala, Pakhangyi, Pakhannge, Legaing, Sagu, Shwe-Kyaung (Mandalay) is part of the Tentative list of Myanmar in order to qualify for inclusion in the World Heritage List. The Konbaung Dynasty was the last Burmese monarchy before British colonial rule started in 1885. With their expansionist agenda they set the current borders for Myanmar. 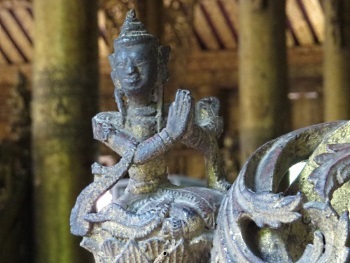 Since 1996 a group of 7 Wooden Monasteries from the Konbaung Period has been on Myanmar’s Tentative List. They are located in Ohn Don, Sala, Pakhangyi, Pakhannge, Legaing, Sagu and Mandalay – scattered roughly in the area between Mandalay and Bagan. In contrast to the earlier brick architecture of the Pyu and Bagan civilizations, these monasteries owe more to pre-Buddhist Southeast Asian house-building practices and beliefs than to Indian prototypes. Shwe-Kyaung in Mandalay was my first encounter with these teak wood monasteries. I had been cycling around town all morning without seeing many tourists, but this is a major sight well on the beaten track of every tour guide. There’s an entrance fee to this and all other landmarks of Mandalay (valid for 5 days), costing 10,000 kyat / 7 EUR. The building originally belonged to the royal palace and was intended as sleeping quarters for the king. After he died, the building was donated to a Buddhist monastery in 1883. It became known as the Golden Monastery, because the wood was completely gilded. Inside it has still partially retained its golden glow. The main attractions however are its many finely carved figures, especially the Jataka scenes. This was the most outstanding single monument that I saw in Myanmar. At the end of my trip I set my sights on the fairly obscure Pakhangyi and Pakhannge monasteries. The travel agency where I booked my car plus driver was confident about getting me there. And indeed the next day we drove straight to Pakhangyi, where a 5,000 kyat entrance fee was collected. This former monastery clearly demonstrates the linear plan typical of the Konbaung monasteries, with 4 buildings in a row (shrine - prayer hall - main teaching hall - ancillary building). It is raised on 254 pilings, with access to the main platform via massive staircases made of brick and stucco. It is more simple than the one in Mandalay, but I liked the human figures carved into the doors. The building has undergone major renovations in 1992, "ordered by the military regime’s former spy chief Khin Nyunt" – photos inside show the rickety state it was in before that. My final goal was the elusive Pakhannge. The given GPS coordinates point to a spot right in the middle of a river. The travel agent told me I should cross the river and that the driver would wait. We drove for only 5 km from Pakhangyi on a narrow country road, slowed down by a festive election parade for Aung San Suu Kyi’s NLD in front of us. We ended up at the Chindwin river, where the ferryman came into action rightaway. The crossing was short and smooth, and on the other side I asked for ‘Pakhannge Kyaung’. I was enthousiastically guided to … the ‘modern’ monastery in town. This involved some serious mud hiking, as the pouring rain had turned the town’s sandy streets into a mess. They were so kind to lend me an umbrella though. With no English speaking local around, I showed the curious onlookers some of my photos from earlier in the day of the wooden monastery of Pakhangyi - hoping this would trigger a recollection of something similar in their village. The photos were easily recognized as being of Pakhangyi, and they pointed to the road where I just came from. Yes I know where Pakhangyi is, because I was there an hour ago. But where did the monastery of Pakhannge go? So in the end I never found it - it was the largest of this group of wooden monasteries, standing on 332 piles. The building itself seems to have collapsed. I haven’t found any indication that Myanmar is actively pursuing this as a future WHS. A complete nomination dossier would need substantial documentation, something that now seems to be lacking at least in English. The cost of such an undertaking may be too much for the Myanmar Department of Archeology, National Museum and Library. Maybe they can get help from a donor such as Japan with its strong tradition in wooden architecture. the highlight of these monasteries is Shwe Kyaung in Mandalay. Several antique wood carvings in good condition. Pakhangyi is the second best in my opinion. I think it is quite difficult for these monasteries to gain WHS status but you never know. The Schwekyaung monastery included as part of this site is presumably also included in the Mandalay part of the “Ancient Cities” site since it is the only surviving building of Mandalay Palace (though is situated outside the original walls - see later!)? But never mind, it is a superb building and any visit to Mandalay must/will include it. It was built by King Mindon during the 19th Century as a palace building and was originally sited at a previous Capital in nearby Amarapura. In 1857 he decided to move his capital (and many of its buildings!) to nearby Mandalay. Accordingly it was dismantled and rebuilt. There it became part of the Glass Palace and one of the royal apartments. King Mindon died there in 1878. His son King Thibaw subsequently used it for meditation but felt that his father’s spirit haunted the building and ordered it to be dismantled again and rebuilt outside the city. In so doing he gave to be a monastery as a "work of merit" for his father and it was rebuilt as such. As a result it is the only original building from the Mandalay palace, which was completely destroyed by Allied bombing of the Japanese supply dumps there in 1945. The relative ease with which it could be dismantled and rebuilt arises from the design - of which it is one representative among 7 in this T List site. The Konbaung dynasty reigned from 1752 to 1885 when they finally succumbed to the British after losing 3 consecutive wars across 60 years. During this period Burmese teak architecture reached a peak in terms of its carving and these survive reasonably well in this example both internally and externally (though the latter are suffering and some had obviously been replaced), It stands on huge teak pillars carved with dragon figures which support a platform on which stands a multi-tiered structure encompassing several rooms but with a main “altar"/Buddha figure in the middle. It would have been gilded and the interior still contains gilded ceilings, statues and balustrades. As is so often the case when viewing Buddhist art I found it worthwhile to have a good guide to explain the significance of the multitude of figures and motifs. But I guess they can just be enjoyed as works of art. The Tatmadaw military government of Myanmar has rebuilt the palace but it lacks the quality of this building which provides some feeling as to what the original must have been like. Unfortunately we were there on a very wet day. Shoes and socks have to be removed to climb up to and enter the building – beware of the slippery wood if your visit is on a wet day too!